Once the caps are thrown, the degrees are handed over, and school is officially out for summer, there's probably only one thing on your mind: celebrating! 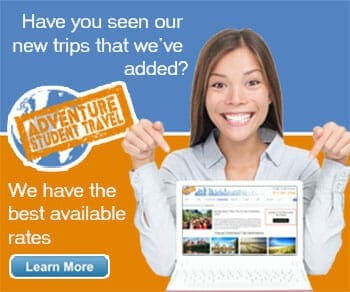 When it comes to celebrating, Adventure Student Travel has you covered! We have planned countless graduation trips, senior celebrations, and student getaways that are all excellent ways to celebrate your academic accomplishments. Your group can take a relaxing vacation on a Florida shore, ski the slopes of a Colorado mountain, or cruise your way to Caribbean paradise. All you have to do is follow this easy checklist and get ready to celebrate! Your group probably already has a good idea of where they want to go in mind, though if you don't we will suggest destinations with your desired travel distance, budget, and local activities in mind. You'll want to prepare a backup location as well, just in case something doesn't work out with your initial choice, be it due to booked hotels, weather conditions, or budget problems. Here are some of our most popular senior trip locations. Whether you want to fight the swarming spring break crowds and travel in January, enjoy the sultry September summer activities on the beach, or leave on a sunny May day right after graduation, we can make it happen! We have had senior groups travel at all different times of the year, some traveling for fewer crowds, some for budget reasons, some for the weather! Not quite sure when exactly your group should travel? That's fine, just give us the general month or season you'd prefer to travel in and we'll look around for the best rates for your visit! An important aspect of our involvement in your trip planning process is deciding the transportation needed and budget to work with. You should have a good rough estimate of an overall budget for your travels, factoring in the transportation you will need to get there. Depending on your distance of travel we will find your group the most budget-friendly airfare, train or cruise tickets, or our most commonly used mode of transportation, a motorcoach company. Once you have your desired location, backup location, desired time of travel, transportation and budget needed, give us a call! Our agents will take your information and talk with you about the details of possible trips! If you are in a rush and can't make the call just take a second to fill out the request form on the righthand side of the screen and we will call or email you back promptly! This is our favorite part of the process, the part in which we get to put together possible itineraries for your group! We take the information from our chats together and put together sample 1, 2, 3, or 4-day (or more) itineraries with your desired location(s), each itinerary giving a detailed schedule of activities you will do during your visit, from breakfast in the morning to entertainment at night. Once you decide on the perfect itinerary we work on making the reservations, finding local tour guides, and planning easy admission to each location. One of the most important and oftentimes most difficult parts of the trip planning process for groups is the funding of it all, which we know can be a lot to deal with around this crucial time in your life, with all those books and dorm room essentials you're trying to buy this summer. If you plan ahead, however, you can make this really easy by fundraising as a class or individual throughout the year. 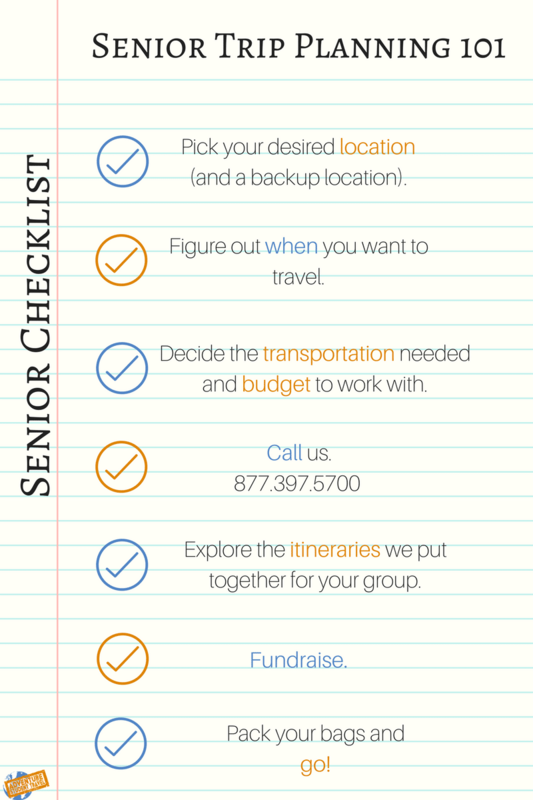 We have plenty of tips on how your group can successfully fundraise for your trip, just follow our SMART system (specific, memorable, attainable, relevant, trendy.) We have a downloadable print out available for detailed fundraising ideas you can get started on today! ✔ Pack your Bags and Go! The hard parts are over! You've fundraised, you've graduated, you're ready for your next big adventure, all you need to do is pack your bags and go! Enjoy, seniors! Want more great travel tips? Check out our College Campus Visits 101: A Senior's Checklist blog!